Welcome to our community links page. We have designed this page to help our patients to find the right support for them within our community. We have tried to research a wide range of resources available. Please see the following information with website links if you require any additional information on a specific community group. If you think of any other groups you feel may be beneficial for us to add please contact us at dccg.townsendenquiries@nhs.net, we will then review the information. Devon Carers is an information and support service run by six organisations working together to improve the quality of services for all carers in Devon; give them a call to find out about how they can support you. The memory café is a wonderfully welcoming place for individuals with Alzheimer’s or any or any type of the dementias or other brain disorders. Additionally, it is helpful for people with all forms of mild cognitive impairment. Individual memory cafes focus on different aspects for a unique experience. Any stroke survivor or carer who might benefit from peer support and/or information would be welcome. Healing and complementary health centre. Welcome those interested in healing, health, self-development and spiritual growth. Breathe easy is a charity that supports the British Lung Foundation. They offer support groups which meet regularly. Their aim is to always improve care and to prevent, treat and cure lung diseases. They meet in Clyst St George on the 1st Saturday of every month between 14:30 and 16:00. Ottery help scheme is a registered charity providing a variety of support services to all those who live in Ottery St Mary and its surrounding areas. Their aim is to unite and mobilise the goodwill of their community, offering support to local residents where it is needed most in times of illness, difficulty or life-changing circumstance. Children's Centres are places where families with children under 5 years old can access relevant services. Whether you are a mum, dad, grandparent, carer or child-minder you are welcome to come to the children's centre and join the groups or activities or get support. Various activities for older people run by local volunteers. Wednesday mornings coffee morning and drop-in session. Thursday afternoons Knit and Natter group. Help for the blind and visually impaired. A participative, lively group suitable for babies and toddlers includes singing songs and rhymes with accompanying actions. This group is run by library staff. Residential care for people with sensory disabilities. Day care for elderly people provided by a residential care home. A charity group run by Seaton and District Hospital League of Friends. We aim to offer a social afternoon with a varied programme of speakers and entertainment, with afternoon tea. Al-Anon Family Groups provide support to anyone whose life is, or has been, affected by someone else’s drinking, regardless of whether that person is still drinking or not. The Seaton meeting happens every Tuesday at 19:30. Provides emergency food relief for individuals and families in crisis and experiencing financial hardship. Food bank in Seaton welcomes donations of non-perishable food at any of the churches in Seaton, Axmouth and Beer and in the bins in Tesco and Co-op in Seaton. A family run business that has been established working in the Seaton and Colyton area providing home cooked meals to their customers. They believe in keeping their customers happy providing quality home cooked traditional meals using locally sourced ingredients giving customer satisfaction. A voluntary organisation that links people in Colyton with appropriate agencies to give help of any kind when necessary. Also provide transport to medical appointments only to residents of Colyton and Colyford. Free support and guidance to help people adopt healthier lifestyles – whether that’s quitting smoking, cutting down alcohol, managing a healthy weight or doing more physical activity. One small step is available both online and by telephone. If you have a disability, long-term health condition or a complex need contact The Ambulance Trust to find out about holiday and short break opportunities that are available . The service is aimed at elderly people with memory problems and also people who would benefit from social interaction. This service is also extended to both family and carers. The service promotes and monitors health and well being. Alcoholics Anonymous meetings have been effectively supporting those who are trying to live alcohol free lives for many decades - meetings are free and no referrals are needed. There is a Seaton meeting every 3rd Sunday of the month. 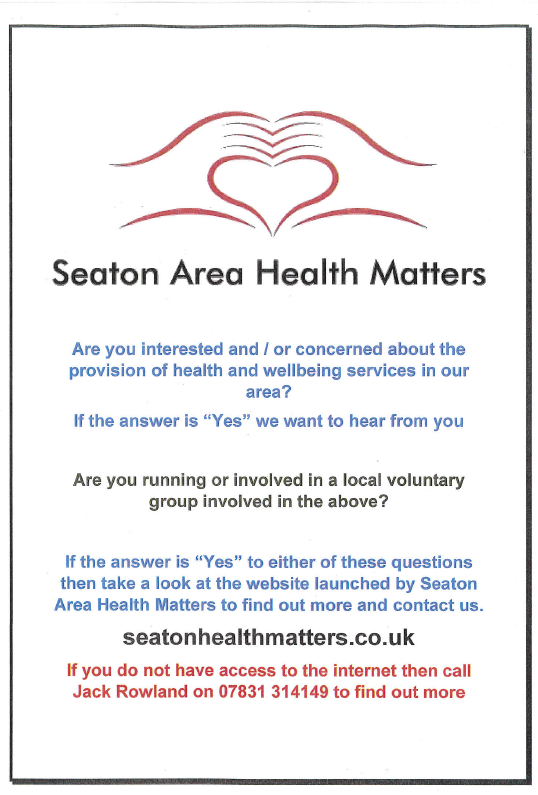 Seaton Health Matters is a network of organistations, individuals and groups that work towards improving the health and wellbeing outcomes for those living in Seaton and the surrounding areas. 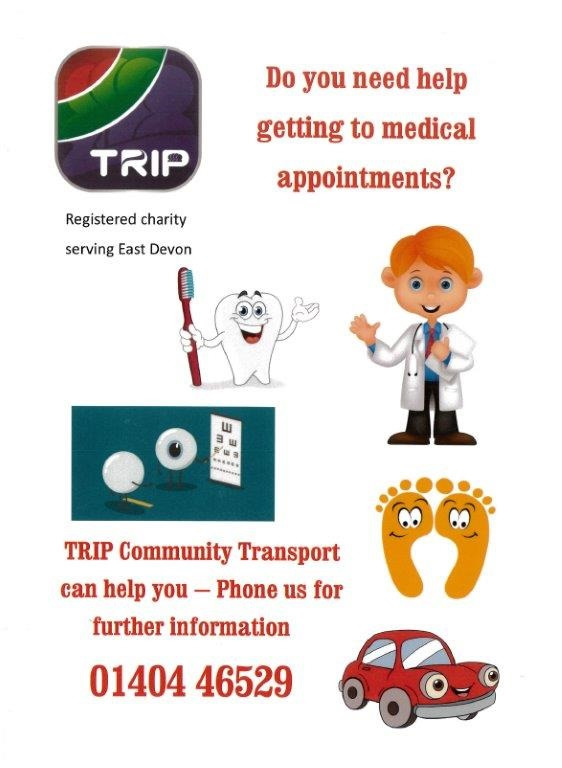 TRIP are the people to contact for any Community Transport information and are able to offer advice for the whole of East Devon. TRIP is available for everyone including the disabled, older people and young people in rural areas. When people with pets become unwell, there is an added stress of considering what is going to happen to their beloved animals whilst they are in hospital. 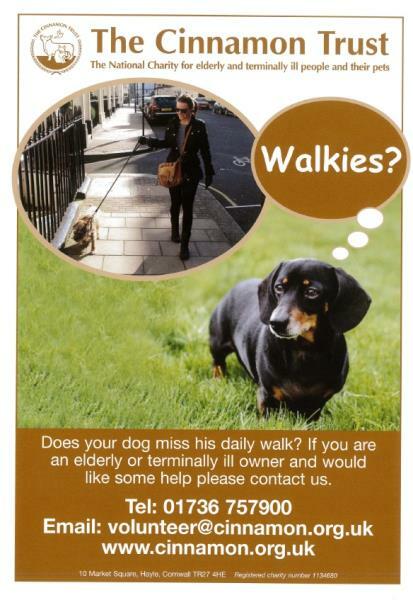 In addition, it may be that a patient is no longer mobile and may need help with exercising their pooch. The Cinnamon Trust is the only specialist national charity for this type of support. They have a network of 15,000 volunteers who 'hold hands' with pet owners so that they can be kept together. For example: they will walk dogs or foster smaller animals should hospital care be required. They will also clean cages and fetch food. Should staying at home not be an option, then The Cinnamon Trust have details of care homes and retirement housing that are happy to accept pets. If it has been previously arranged, they can also take on the care of a pet who has lost its owner.